There is something innately relatable about family dysfunction. Whether you’re part of a tight knit brood or only meet up for holidays, disagreements are inevitable. Sometimes those encounters are flippant, and other times they can be decidedly more hurtful. An adaptation of Tracy Letts’ Pulitzer and Tony-Prize winning play, August: Osage County is very much of the latter variety. Though it’s not helped by John Wells’ workmanlike direction, the razor sharp dialogue combined with supreme acting prove just enough to compensate. When family patriarch and drunken poet Beverly Weston (Sam Shepard, in an efficient cameo) goes missing, the entire Weston clan returns to Oklahoma to support their cancer-stricken, drug-addicted mother Violet (Meryl Streep). Those relations include Violet’s daughters Barbara (Julia Roberts), Karen (Juliette Lewis) and Ivy (Julianne Nicholson), their other halves Bill (Ewan McGregor) and Steve (Dermot Mulroney), and Violet’s sister Mattie Fae (Margo Martindale), with her husband and son in tow (Chris Cooper and Benedict Cumberbatch, respectively). It doesn’t take long for the impromptu family reunion to turn sour. Letts adapted his own screenplay for the film, condensing a three-hour extravaganza into two, and for the most part the cinematic cut retains the liveliness of the play. The film is packed with well-realised characters, but Wells does a solid job of balancing all the big personalities at play even though some subplots resonate more than others. With the Westons almost constantly immersed in verbal battle, you’d be forgiven for thinking that there’s no way this group of people share the same bloodline. Still, though August is often a loud and harsh exercise there are some subtle touches that enhance the notion that we’re watching a family drama as opposed to all-star actors bellowing at one another. 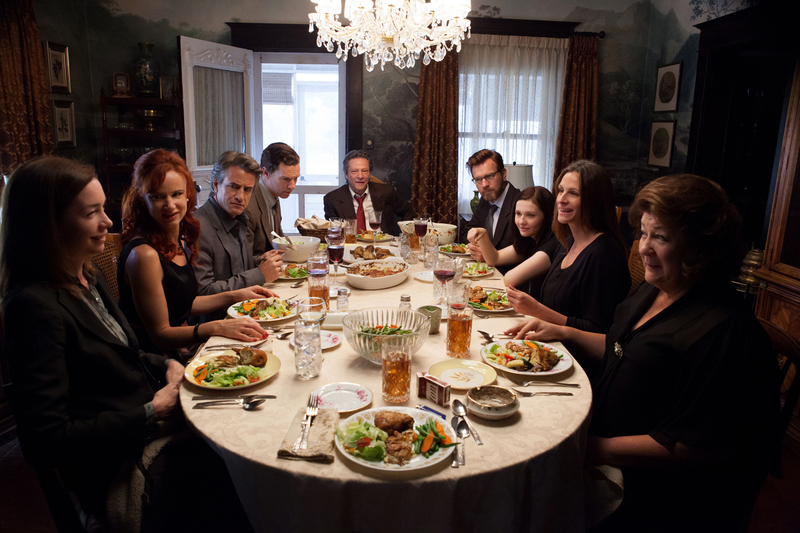 In this regard, the shout-fest that is the Weston family dinner is a 25 minute standout centrepiece that is both entertaining and uncomfortable viewing, often within seconds of each other. For all its narrative nous however, cinematically August offers very little. Where William Friedkin’s direction of Killer Joe – another Letts brainchild – was vigorous, here it often feels like we’re watching a filmed version of a play (albeit a very good one), with Wells seemingly all too happy to get out of his actors’ way. Fortunately he has a terrific ensemble to call upon and the performances across the board are all excellent. Almost each actor gets at least one moment to shine, with Cooper’s stirring third act monologue easily one of August’s best scenes. Predictably though, it’s the two biggest names that chew up the most scenery. Streep’s Violet is never less than engaging, discharging verbal vitriol under the pretence of ‘truth-telling’ with surgical precision. Matching her at every turn is Roberts’ Barbara, the eldest of Violet’s progenies and the one to whom the matriarch’s dysfunction cuts deepest. Both Streep and Roberts have received Academy Award nominations for their performances, and both are well-earned. 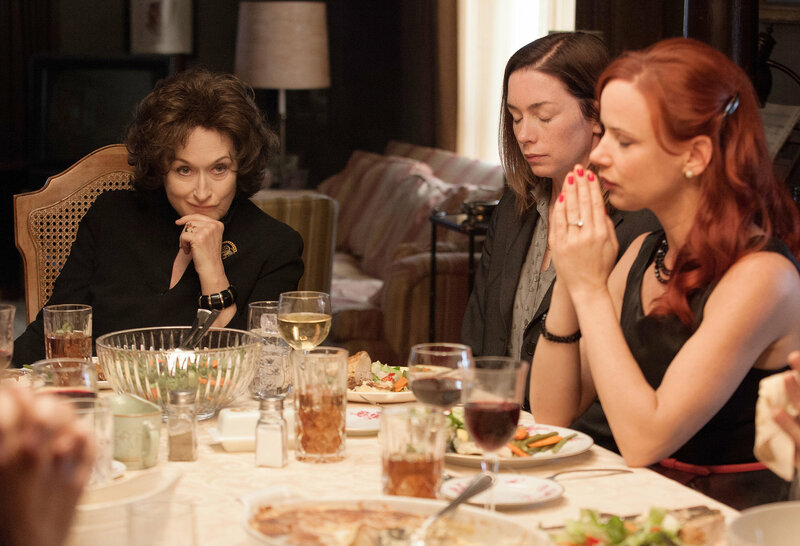 Cinematically wanting but never dull, the excellent acting on display is enough to make a trip to August: Osage County worthwhile. At the very least, you’ll leave with a newfound appreciation of your own family. This entry was posted on January 24, 2014 by Amonymous. It was filed under Film Reviews and was tagged with August: Osage County, Benedict Cumberbatch, Chris Cooper, Dermot Mulroney, Ewan McGregor, John Wells, Julia Roberts, Julianne Nicholson, Juliette Lewis, Margo Martindale, Meryl Streep, Sam Shephard, Tracy Letts. “At the very least, you’ll leave with a newfound appreciation of your own family” LOL yes! Great review, Amon. I just saw this one this week as well, but I would rate it much higher. LOVED it. Haha thank you sir! Looking forward to reading your thoughts.